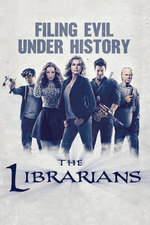 I found this The Librarians AfterBuzz TV AfterShow podcast on iTunes yesterday, and listening to the John Rogers interview 12/19 episode gave me hope for the show. (I do not recommend listening to the episodes where it's just the two hosts discussing the episodes, I gave up 5 minutes into each of them so far). Anyway, Rogers mentioned in the interview that though there's no official show podcast like there was for Leverage (both because the people that ran that podcast for him have new jobs, and because production of the season wrapped before the series premiered so they're all scattered until/unless there's an S2 pick-up) he's started up old Leverage tradition of the post-show Q&A on his blog - Kung Fu Monkey. That alone is going to keep me watching, so, might as well keep posting these threads. I liked this one almost as much as the Santa episode. Per the blog, this was shot 9th out of the 10, so seems like they really found the level of goofiness they were going for. Really enjoyed the Larroquette scenes, looking forward to the reveal of what his origin story is, and just how old he & Dulaque are. Anything with a Buckaroo Banzai reference is all right by me. I also enjoyed this one and always appreciate the cameo appearance of Cary-Hiroyuki Tagawa as Mr. Drake. They've been pulling in some great B level actors for single shots, so I hope that also continues, so long as it isn't a distraction. Jenkin's character continues to be more and more interesting and the temporary return of Noah Wyle wasn't too bad, either. I think it was a great sign for the show that when he did appear and for much of the episode, his presence didn't necessarily always feel needed. The cast is already growing strong enough to carry the show on their own without the "head liner" so to speak. Evil Stone equates to being angry about landscape placement. Evil Cassandra equates to evil mastermind who delights in killing hundreds of thousands and setting Europe back into the stone ages. Dang. The show is definitely skidding a bit goofy, but it's okay, because that's the show we were promised. I'm liking it. I wonder how long they will tease out the flirtations between Wyle's and Romijn's characters. Hrm. So did Jenkins and Dulaque....date?!?! Dear lord, did Noah Wylie get to have some fun eating all of that scenery. He looked like he was having a blast. So Ezekiel's already the worst version of himself? Hmmmmmmm there.